Guest Post from Penguins and Pineapple: Why IVF is not "whimsical"
So this really wasn’t the subject I wanted my first blog post to be about. But with things that have been going on in the past few weeks, I felt that I had to write about it. Anyone who is in the TTC community will know what I am talking about – Sirena Bergman. She wrote an article in The Independent suggesting that IVF should not be offered at all on the NHS, and then went on national television a few times to talk about the article. Since her TV appearances, I have seen many women from the TTC community try and contact her via instagram. Yes, a small minority of the comments were nasty, and could be called bullying, but the vast majority were just trying to tell her their heartbreaking stories and why they disagreed with her views – and they were all blocked and their comments deleted. Including mine. I really do believe that everyone is entitled to his or her own opinions. However, if someone feels so strongly about a subject that they had to write for a national newspaper and go on national television to talk about said subject, they should be prepared to listen to the response. And if the subject is somewhat controversial, then they should be prepared to debate. I do understand that the NHS is struggling, big time. Someone has to prioritise somewhere. But Sirena Bergman’s views that IVF shouldn’t be funded on the NHS as people have IVF when they just “fancy having children” cannot be further from the truth. But the thing is, I do get it. I get why she might think this way. I didn’t quite share her point of view before my husband and I struggled to conceive – but until it happened to us, I had absolutely no idea how heartbreaking it would be. How it consumes your whole life. All you think about is babies and wonder if it will ever happen to you. And I know that there are plenty of others out there who don’t really understand either. And reading articles like Sirena’s may make them think the same way. This is why I had to write this. I need to try and get the other point of view out there. I remember getting so upset when I got my third period after my husband and I started trying. I just cried. I couldn’t understand why it wasn’t happening for us. And this went on month after month. I started getting more upset, more often. As my husband wanted to be private about our struggles, I didn’t talk to anyone and really believed that I was a freak. Why on earth was I getting so upset? It was only when I started talking to other women online who were also struggling to conceive that I realised I wasn’t the only one. It was affecting all of them in the same way. And I read something quite recently that made me realise why: the strongest instinct that a living being can have (after survival) is to procreate. This is so important to ensure that that particular species doesn’t die out. I started thinking about every David Attenborough programme I have ever seen – and realised that they mostly included animals trying to attract the best mate in some way, or fighting over a potential mate. Some insects survive for a matter of hours PURELY to procreate. And that’s when it hit me. Humans are born with this instinct too. It’s something within us that we cannot control. This is why it’s so devastating when it doesn’t happen. And definitely not something that we are just ”dissatisfied with”. Sirena argued that women are pressured from birth to believe that “Wanting to have biological children is considered the default setting, and women who don’t feel this way are patronised and coerced into changing their minds”. However, my opinion is that I think it’s the opposite that’s reality – firstly, let’s not forget that men also have this INSTINCT to procreate as well as women, and it’s the society of today that is making it more and more acceptable to NOT have children. Women have careers now, people like to travel, money – there are plenty of reasons not to have children (“things” that other animals don’t think about). Sirena also said on Lorraine that allowing IVF to be available on the NHS is enforcing stereotypes that women can only be fulfilled by having a baby. Sirena claims to be a feminist. If women do feel like they have to have a child to feel fulfilled, what is wrong with that? Surely a feminist’s role is not to tell women they are wrong to feel that way? And I do not claim to be a feminist or know a great deal about it – but I always thought feminism was about first of all, being proud to be a woman, and then empower women to do whatever they wanted and to support each other? I didn’t realise feminism was trying to ignore the fact that women and men are actually physically different? Because we are! There are some things that are not “gender stereotyping”, but physiological differences. There is nothing we can do about it. The fastest man will always be faster than the fastest woman. The strongest man will be stronger than the strongest woman. Women have a womb and men don’t! So unless the film “Junior” becomes a reality, or artificial wombs are created (and I’m sure both will become a reality at some point), women carry babies, and men don’t. This is fact. Saying that IVF shouldn’t be offered on the NHS because it enforces gender stereotypes is surely the same as saying women shouldn’t be offered treatments for things that only affect women – such as getting help during the menopause or be offered smear tests? Even though I do have lots going on in my life that make me happy, I personally do feel that I will not be totally fulfilled without having a child. This is nothing to do with social pressures. I have to endure periods every month or so for what, approximately 35-40 years? I personally want a reason for me having to go through that! Sirena also says that people have IVF because they have a whimsical obsession with having a child. No one wakes up one morning and decides that they will have IVF. Yes, they may wake up one morning and decide that they want to have a child – but unless they know there is a medical reason why they cannot conceive naturally, they will just start trying. The old fashioned way. And if it doesn’t happen first month, they will try month after month after month. They may go to the doctors after a few months and be turned away and told to come back when they have been trying for a year or two. Once they do get referred for more investigations, there will be more months of waiting and the couple will still try naturally. Depending on what the issue is, the woman may try different medications for a few months. Once you are referred for IVF, there is again more waiting. 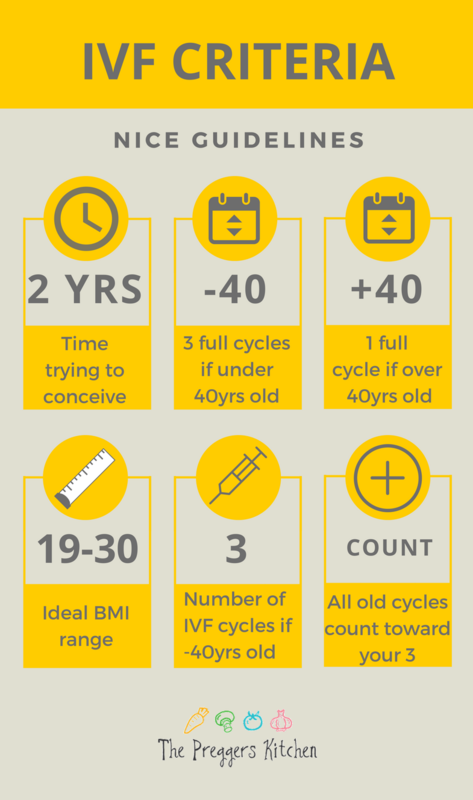 The chances are you would have had to wait at least a year and a half before you start your first IVF cycle on the NHS, though for most people, it is so much longer than that. It’s definitely not something whimsical. If people were just trying to conceive because of pressures from society and it’s not something that they really want, they will give up before they get anywhere near that point of starting IVF. So let’s now talk about the subject of IVF being available on the NHS, which is what the main point of the original article was. Sirena argues that the NHS should be available for curing illnesses and not for curing dissatisfaction. I don’t know how much NHS budget is actually spent on “curing illnesses”, but I am guessing that it actually makes a minority percentage. Have I used services provided by the NHS before? Yes of course I have. I think that my NHS usage throughout my life is probably “average”. When I was younger, I had an operation to fix my sinuses, and quite a lot of orthodontic treatment. As an adult, I have had wisdom teeth extracted, I have seen the GP when I suffered with insomnia for 6 years and have also been to the GP a fair few times in my life for flu like symptoms. Oh, and I have sprained my ankle twice and suffered a very bad reaction to some new face wash.
And guess what, I have also seen the GP and had counseling on the NHS due to emotional distress caused by infertility. And even though I’m sure that the majority of you would say my NHS use is “acceptable”, I guess the biggest cynics out there could call all these things “curing dissatisfaction”. Were any of these things life threatening? Nowhere near. And scrapping IVF on the NHS means that only the well off are able to procreate if they struggle to conceive naturally. Whenever the topic of IVF on the NHS comes up, there are always comments from the public who say, “if people cannot afford to pay for IVF, they cannot afford to raise a child”. Putting the subject of people on benefits wanting a child to one side, there are plenty of people out there who are low earners and will absolutely cope with having a child. Yes they may have to sacrifice some holidays and maybe buy some things second hand – but they get by with what they earn. But tell them to find an extra £5k (which will probably be the absolute minimum they may need if an IVF cycle works first time) and their dreams of having a family are shattered. And it’s not just the cost of the actual IVF procedure to think about. Many women (and men) change their lifestyles for months before starting the cycle to give themselves the best chance of it working. This could include buying organic food, supplements, buying non-toxic toiletries and cleaning products, acupuncture, personal trainers – all things that could add up to 100s of pounds each month. Again, many people could not afford to do this and save up for an IVF cycle at the same time. Another thing that Sirena mentions is that we are facing a problem of overpopulation, and this is another reason IVF should not be offered on the NHS. She mentions that the United Nations projects our global population to have risen to 9.6 billion by 2050. Firstly, I don’t think that looking at the global population is relevant when you are talking about the NHS. The NHS is only available in the UK so we should only look at the UK population. And I know that the UK population is also rising. But this is NOT because people are having too many children. The total fertility rate is now down to 1.81 children per woman – far less than the 2.4 figure commonly used in the past (and was even a name of a popular sitcom if any of you remember!) The reason for the overpopulation is because we have an ageing population. People are living much longer because of improvements in medicine. And guess what this means? We actually need younger people to help pay their pensions and help care for them! Yes it is over a long period of time, but you could actually consider IVF on the NHS to be like an investment? Some children born via IVF might end up being reliant on benefits for most of their lives, but you’d expect most of them to contribute back to society in some way. And the last thing I will touch on (because this blog post is turning out to be much longer than I expected!) is the notion that instead of going through IVF, infertile people should just adopt. Apparently, there are 70,000 children in care in the UK. I absolutely feel for these children, and of course believe that every child should grow up with love and security. However, why is this purely the responsibility of infertile couples? Just because a couple CAN get pregnant easily – why shouldn’t they adopt or foster a child? Adoption is a solution for some couples (some infertile and also some not). But it definitely is not a solution for everyone. And an infertile couple that chooses not to adopt or foster should not be thought of as selfish or anything derogatory. Adoption is a massive life decision that would definitely not be made easily (or whimsically). And let’s also look at the numbers anyway. Infertility affects 1 in 7 couples in the UK. That is approximately 3.5 million people in the UK. 70, 000 children for 3.5 million people – it doesn’t quite add up. And let’s not forget the ridiculous scrutiny you have to go through to be accepted as adopters (some children have been through some awful times in their short lives – of course you have to make sure that they are placed with the right families). But I have heard of people getting turned down because the couple worked as a teacher and a nurse, one of the couple had been in care as a child, and the couple’s house was too clean (yes you read that right). And if you go abroad to adopt, you are looking to pay tens of thousands of pounds. There is no “just” in adopting. So here you go. This is all just my opinion. I am not an expert in anything, but I hope that this helps shed some light on the other side of the story.